Birth*: Mary Stirling was born on 9 August 1834 at Dunnichen, Angus, Scotland. She was the daughter of David Stirling and Jessie Smith. 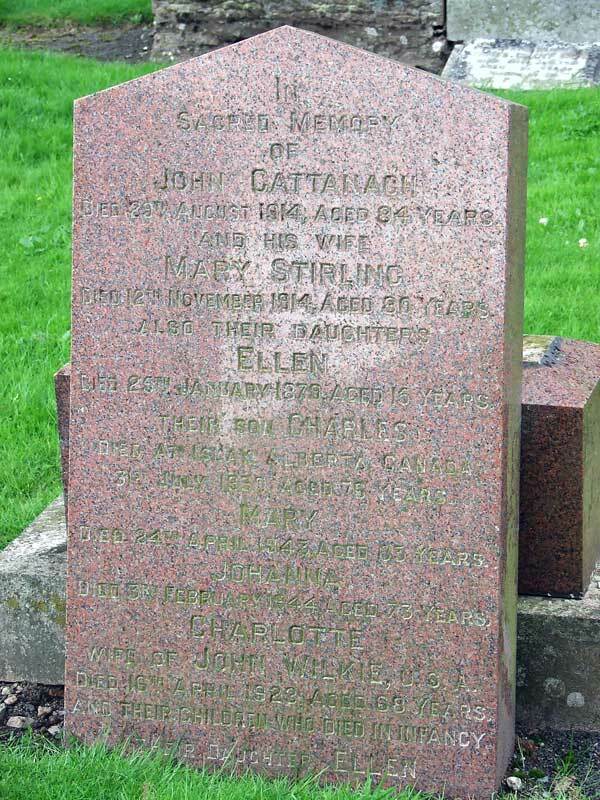 (Bride) Marriage*: Mary Stirling married John Cattanach, son of Charles Cattanach and Charlotte Fyfe, on 6 February 1853 at Dunnichen, Angus, Scotland. Mr and Mrs John Cattanach. The 60th anniversary of their wedding was celebrated on Saturday by Mr and Mrs John Cattanach, South View, Letham, when there was a family gathering. The only son, Charles, is in America and could not therefore be present. Mr Cattanach was only 9 years old when his father took the farm of East Mains of Dunnichen, and he has spent practically all his days in Dunnichen parish. He was born in Aberlemno in 1830, and is now 83 years of age. 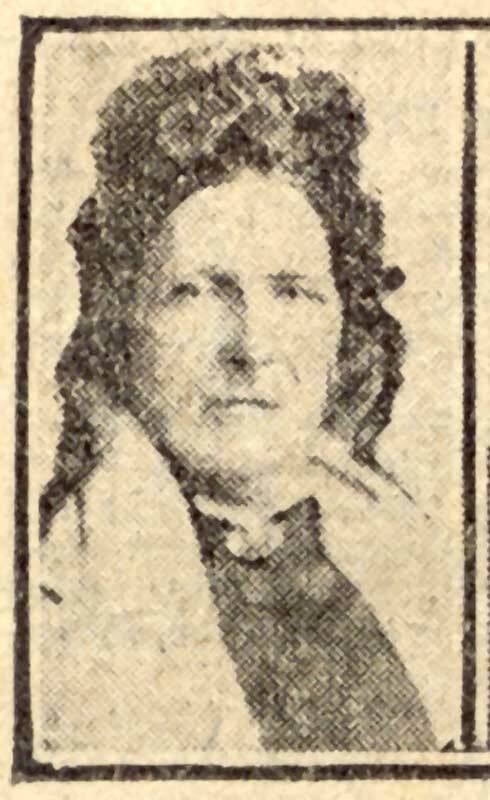 Mrs Cattanach was born in Letham in the very house where the couple have spent most of their married life. She is her husband’s junior by four years. Her maiden mane was Mary Stirling, and it is an interesting fact that the Stirlings have been in Letham for many generations. They were married at Drummietermont, Dunnichen on 11th February 1853 by the Rev. Alexander Ross, parish minister of Dunnichen. Both husband and wife are tall, and the minister remarked at their marriage that while he had married bridegrooms as tall and brides as tall, he had never married a couple where both bride and bridegroom were so tall and handsome.! There have been six of a family, five of whom still survive. There are 16 grandchildren and 7 great-grandchildren. 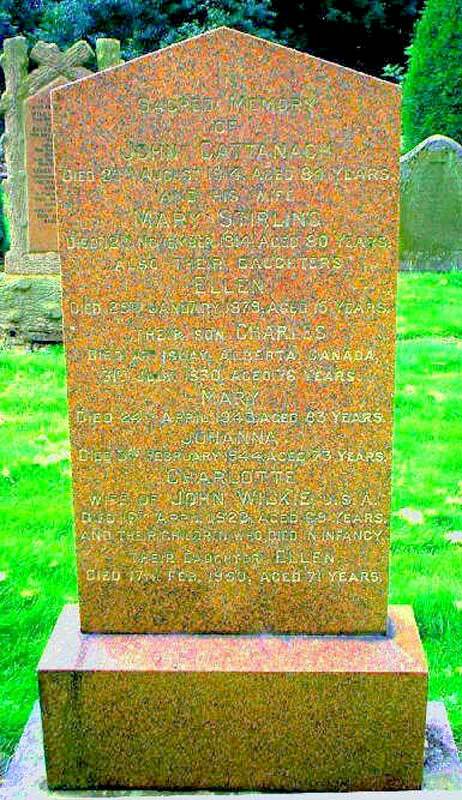 Member of Household 6 June 1841 Mary Stirling was listed along with David Stirling in the 1841 census at Guthrie Street, Dunnichen, Forfarshire, Scotland. David Stirling, 36, linen hand loom weaver, Angus; Mary Stirling, 8, Angus. [S32] Newspaper Article, Unidentified Newspaper 1913 from JS [Jan 2011]. [S50] Unknown name of person, unknown record type, Dunnichen GROS ref 283/00 0012 (unknown file date), General Record Office of Scotland, New Register House, Edinburgh, Scotland. [S40] Gladys Leith [Nov 2009].